The search for Ray Palmer continues and brings our heroes to Earth-30, an Earth where Superman landed in Russia (don't worry - I provide more background below for those unfamiliar with the original Elseworlds series). So naturally, they arrive in Russia too. After donning native garb and translators, Jason and Donna sneak into the clinic that creates the so-called "Superman robots", essentially lobotomized dissidents. Jason pauses at a supposed zombie - the guy looks familiar, did he just move? After Jason and Donna move on, the guy gets up and runs off, already engaged in a mission of his own. Jason and Donna find who they're looking for and it is Ray Palmer - who's going to become "robot-ized". The guy in disguise earlier of course was Batman of Earth-30 and Jason and Donna come upon him hovering over an unconscious Ray Palmer. Seems Batman is there for the same reason as Jason and Donna - to rescue Ray Palmer. The heroes are attacked by armed forces, bombs, and countless troops. Kyle arrives on the scene and protects them all in a GL energy bubble. But Earth-30's Superman arrives. Donna does her best to cover the escape of her friends and face down Superman - though she's taken down by Earth-30's Wonder Woman. Later, Batman, Jason, Bob, Kyle, and Ray talk. This is the Ray Palmer of Earth-30 but he has seen the New Earth Palmer who'd visited him days earlier. The Earth-30 Palmer had been brought to Russia by Superman to help with research in enlarging the city of Stalingrad, which had been shrunk and bottled years ago by Brainiac (chronicled in the original series). But ultimately Palmer worked secretly with Batman - and after being found out was on his way to be robot-ized, when Batman, Jason, and Donna found him. Batman asks Ray to plant a small powerful explosive - in Batman's own small intestine. Meanwhile, Wonder Woman and Superman question Donna under the magic lasso's influence. Superman consults the Brainiac robots which he has since defeating the original Brainiac co-opted the technology for his own use. Brainiac suggests they dissect Donna to confirm she isn't a weapon of the American scientist Lex Luthor. Superman authorizes it. The Challengers, Earth-30's Atom and Batman attack, and capture Wonder Woman and use her lasso to get her to tell where Donna's being held. Jason and Kyle rescue Donna - they use the fact that yellow remains a vulnerability to GL rings in the Earth-30 Multiverse but isn't a problem to Kyle to lull a defending Brainiac robot into believing he can neutralize Kyle's GL ring with bright yellow light. Kyle smashes Brainiac. Batman uses Wonder Woman as a hostage and uses red solar energy to weaken Superman. Batman buries Superman in a Siberian Detention Camp. Wonder Woman sacrifices herself to save Superman. He gets his powers back and quickly overpowers the Challengers. Facing Batman, he promises to robot-ize him but Batman suggests he'd make a better martyr than a pencil-pusher and blows himself up. All appears lost - the Challengers have been overpowered and are going to be robot-ized. Ray Palmer of Earth-30 then 'calls' Superman from a phone booth inside the shrunken bottled city. He threatens to enlarge and destroy the bottle unless Superman releases the Challengers and returns their weaponry to them. He releases them. They leave Earth-30. Story - 4: This is a first for these "Search for Ray Palmer" Specials. It's the first visit to a former Elseworlds turned member of the Multiverse where the changes in the Earth's history from New Earth are motivated primarily - if not exclusively - by Superman's mythology. Principally, the big difference started out as one of timing. 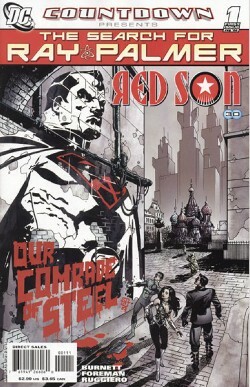 As explained in the original "Superman: Red Son" (a three-issue prestige format Elseworlds title released in 2003, and written by Mark Millar), baby Kal-L's (it is the Golden Age Superman's spelling of his Kryptonian name without the "-E" in "-El" that this Red Son Supey has too) rocket from Krypton to Earth arrives 12 hours later than it does to New Earth. Those 12 hours are critical for the rocket doesn't hit Earth's atmosphere over Kansas in the United States. Kal-L lands in the Ukraine. The original "Red Son" series spanned the period 1950 to 2000. There's a clever epilogue in the far future that has the descendants of a dying Earth in the far future rocketing their child to the past - clever if you haven't seen the original "Planet of the Apes" series. I am mostly enjoying these "Search for Ray Palmer" specials and this one is one of my favorites. It definitely captures the feel of the original series without stepping on its toes. Back in the pre-Crisis on Infinite Earths days, even with the non-stop crossovers going on between heroes of different Earths, DC always tried to keep a sense of true wonder as heroes took in the differences between their home and this new Earth. In this special, it's as if the Challengers experience that sense of wonder in reverse. It's a sense of absolute despair on a world they can't change. It's a Superman who does the right thing - but his definition of the right thing is just different than it would have been had he been raised in Smallville. And it's a Superman who remains the planet's principal influence and the other doppelganger Justice Leaguers' main inspiration - whether it's an inspiration to follow his lead like Wonder Woman or an inspiration to pursue freedom at all costs like Batman and Ray Palmer. Things are the way they should be on Earth-30, whether the Challengers like it or not. Art - 3: The art was serviceable but inconsistent. Too often, characters with dark hair were pretty indistinguishable which was a bit confusing (though I see the imagery in doing something like that for the artist when creating a society defined by conformity). But then, there's this out-of-place almost Manga version of Donna Troy who slugs Superman. Still I can't hate any artist who can do a good and creepy scary robot Brainiac. Cover Art - 4: I like the cover. I'm reminded of the "Brave New Metropolis" episode of "Superman: The Animated Series" and how a dimension-displaced Lois discovered shocks like these. Even the live-action "Adventures of Superboy" went into this territory with a totalitarian Boy of Steel. The cover displays everything cool about a super-dictator Superman storyline: the jarring atypical Superman image, the spray-paint creating a notion of rebellion, and the shock of our New Earth fish out of New Earth water. Well done.